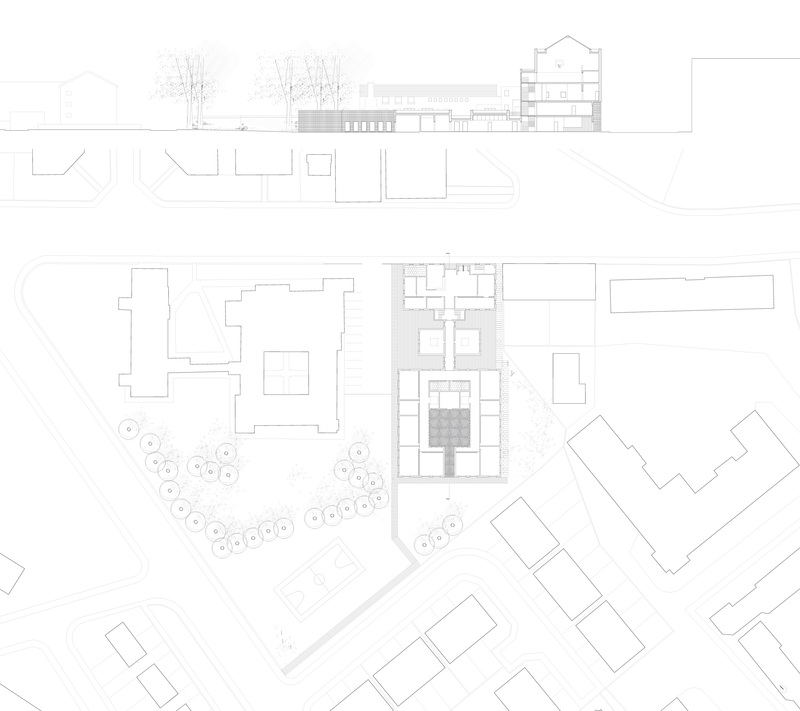 Notes on Andrew Melville Hall as a transitional work in the architecture of James Stirling. Standing in the shadow of Modern masters such as Walter Gropius, Mies van der Rohe, Frank Lloyd Wright and Le Corbusier, the generation that graduated from architecture schools in the extended decade after World War II – Robert Venturi, Oswald Mathias Ungers, Aldo Rossi, James Stirling to name a few – were critical of the social and urban effects of Modern architecture. Yet they were reluctant to abandon Modernism altogether. Instead, they put forward a critique of Modern architecture and in doing so searched for an architectural language that might extend, overcome or break free of Modernism. On one hand there was a tendency to extend the technological and functionalist approach of Modernism as is evident in projects such as Kenzo Tange’s Tokyo Bay proposal (1959) or the buildings of Paul Rudolph in America. On the other hand there was an approach that rejected Modernism and put forward a stylistic mimesis of historical architectural form exemplified in BBPRs Torre Velasca tower in Milan (1956-58) or the “Townscape” aesthetic in Britain. James Stirling questioned both of these tendencies as can be seen in his University projects such as the competition proposal for Churchill College for the University of Cambridge (1959), the “canonical” Engineering Building for Leicester University (1959-63), the History Faculty at Cambridge University (1964-67), the Florey Building at Queen’s College, Oxford (1966-71) and Andrew Melville Hall for St Andrews University (1964-68). While the Engineering Building, the History Faculty and the Florey Building are broadly similar in their formal and material language – using faceted glass walls, brick and tile units in horizontal bands, building mass articulated as distinct volumes composed centripetally implying spatial force is directed from edge to centre – and remembering that Churchill is a square plan court within a court principle, Andrew Melville Hall departs from this language. Andrew Melville Hall is a student residences in St Andrews on the East Coast of Scotland around 80 km north of Edinburgh. It is a picturesque town, and rather conservative in appearance and ethos. Stirling intended two pairs of identical buildings for the edge of town site, however only one single building was completed. The building itself is composed of two slab-wings of unequal length – one rotated off the primary axis – extending from a central block, which creates a large outside court. An enclosed stair is adjacent to the central block. These distinct parts are connected by a glazed promenade gallery. Andrew Melville Hall reads as composed centrifugally with implied spatial force stretching outward. We see this in the slab-wings which extend out in one direction, in the enclosed stair which extends in the opposite direction, and in the glazed promenade gallery which cuts through the building. 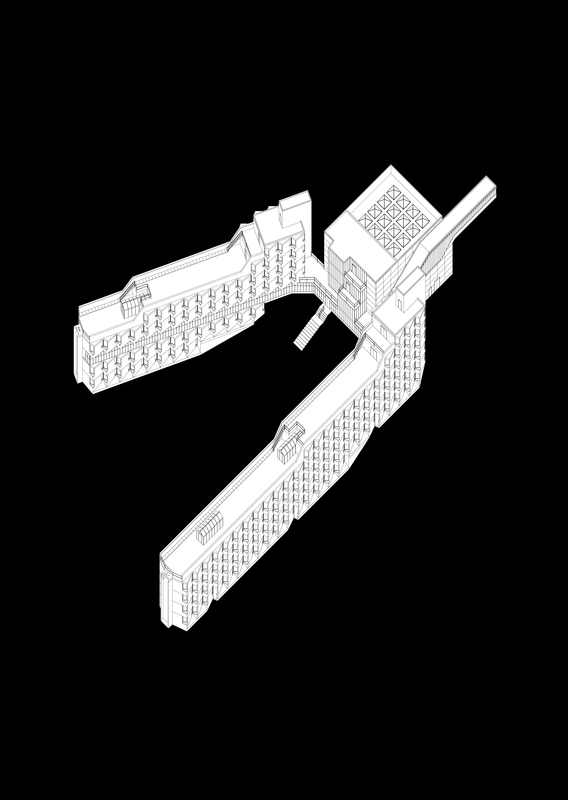 Furthermore, Andrew Melville Hall is not a unified mass but an assemblage of distinct volumes – slab-wings, central block, enclosed stair and promenade gallery – in formal and spatial dialogue with each other through shifting axes, rotations in plan and interpenetrations of opposing elements. The building departs from the language of Stirling’s prior University buildings and should be viewed as a transitional work that points obliquely toward the spatial complexity of his museum and gallery projects of the coming years in particular for its centrifugal composition. It is interesting to remember that Andrew Melville Hall was completed in 1968 at the end of a pivotal decade in which seminal architectural texts were published including Robert Venturi’s Complexity and Contradiction in Architecture (1966), Aldo Rossi’s L’architettura della città (1966), and Manfredo Tafuri’s Teorie e storia dell’ architettura (1968). This period and the years into the 1970s were a greatly productive period for architecture when architects engaged with the history of the discipline and viewed their role as a crucial contribution to architectural and intellectual thought more broadly. It was for sure the last major period in architectural culture when architecture was recognised as a significant intellectual pursuit. Studying the era has a dual effect. It brings into relief the present condition of architectural production, which often seems weak, diffuse and committed merely to general consensus; yet simultaneously the projects of that period – theories, books, architectural designs – provide critical reference points from which we might project beyond the current architectural impasse. This post condenses ideas from a longer essay entitled “An Archaeology of Fragments” commissioned for Scotland + Venice 2014 under the direction of Neil Gillespie of Reiach and Hall Architects, and published in the paper “Outsiders” at the Venice Architecture Biennale. 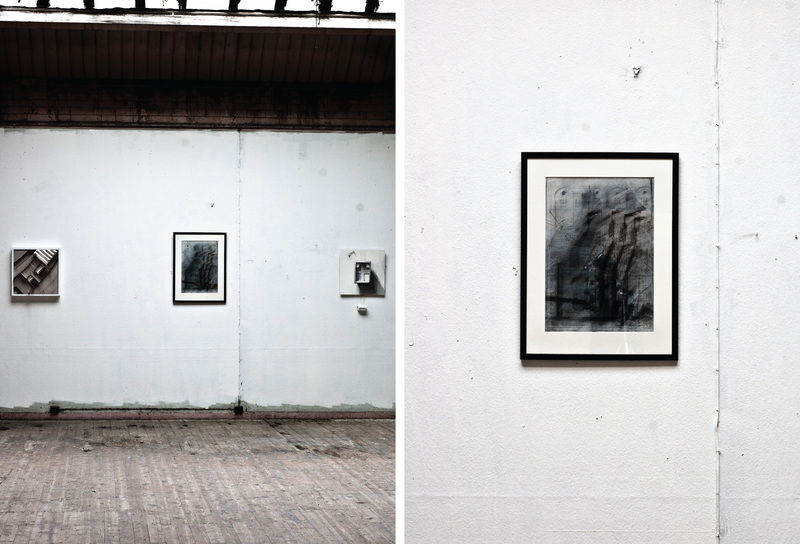 Island: A recent exhibition by the AE Foundation and a note on the category of authorship. In November the AE Foundation put on an exhibition at Whitespace in Edinburgh of eight new house designs for the Isle of Harris in the Outer Hebrides. The exhibition, curated by Samuel Penn and Rowan Mackinnon-Pryde, included designs by, amongst others, Christ & Gantenbein Architects, Raumbureau, Raphael Zuber, and Pascal Flammer. The project, entitled “Island,” revisits the tradition of using a client to advance the formal and conceptual preoccupations of an individual architect through the design of a private house. The main purpose of the project was to challenge the formal preconception for houses designed for the Highlands and Islands. Accompanying the exhibition was a book that compiled the house designs and an essay (authored by me), which appraised each of the eight designs then briefly reflected on the category of authorship. My analysis focused on space and form rather than style or experience and was intentionally abstract rather than figurative because this was a way to discuss the shared characteristics of a series of spatially and formally varied designs. Crucially, another shared characteristic of the architects in the exhibition is their belief in the status of the architect as singular author. This position – the architects authorial role – has suffered in recent years particularly since the turn of this century due to participatory tendencies and of consensus driven design decisions. 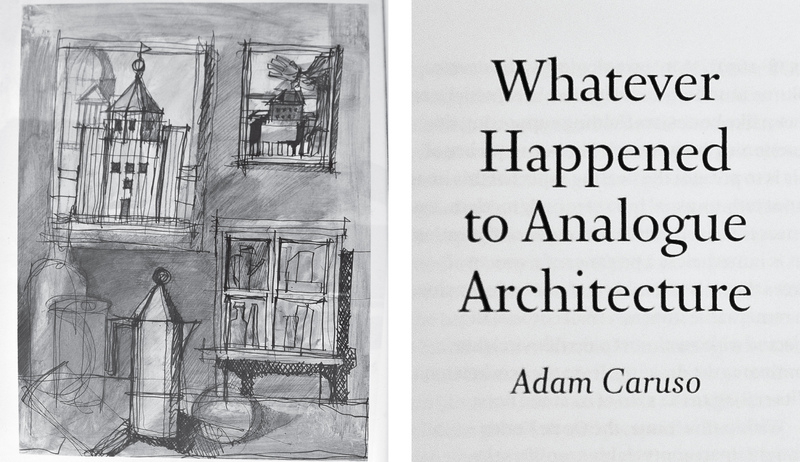 What is at stake in current architecture is not new forms (although the production of form is clearly a quintessential critical tool of architecture), but rather the atomisation of the architect-author and the fundamental cultural value of architecture itself. The point here is that the architects social purpose, their intellectual role as critical thinker and their contribution as form giver to society is now replaced by a technocratic and managerial role within the weak pluralist ethos of today. As the history of architecture shows us, we need committed individuals – uncompromising architects – to produce strong architecture to develop the discipline with a view to overcoming the current architectural impasse. The city itself is the concrete embodiment and the collective historical sum of manual and mental human labour. The city plan – whether theoretical or as built, a precondition of the city, or not – is the representation of singular values, common beliefs, critical sensibility, and a manifestation of a particular way of looking at the world, and of ways of living. With this position in mind, we assigned our students a canonical city plan as a lead-in to this years Rooms + Cities Masters Unit. The selected city plans were the following: Filarete’s Ideal City of Sforzinda (c1460), Giambattista Nolli’s La Pianta Grande di Roma (1748), Giovanni Battista Piranesi’s Campo Marzio (1762), Ludwig Hilberseimer’s Hochhausstadt (1924), Le Corbusier’s Ilot insalubre no. 6 (1937), Archigram’s Instant City (1969), Rem Koolhaas’ Exodus, or the Voluntary Prisoners of Architecture (1972), Oswald Mathias Ungers’ (et al.) Berlin: A Green Archipelago (1977), Costantino Dardi’s panel for Roma Interrotta (1978), Bernard Tschumi’s Street in The Manhattan Transcripts (1978), and finally Pier Vittorio Aureli’s Stop City (2007). 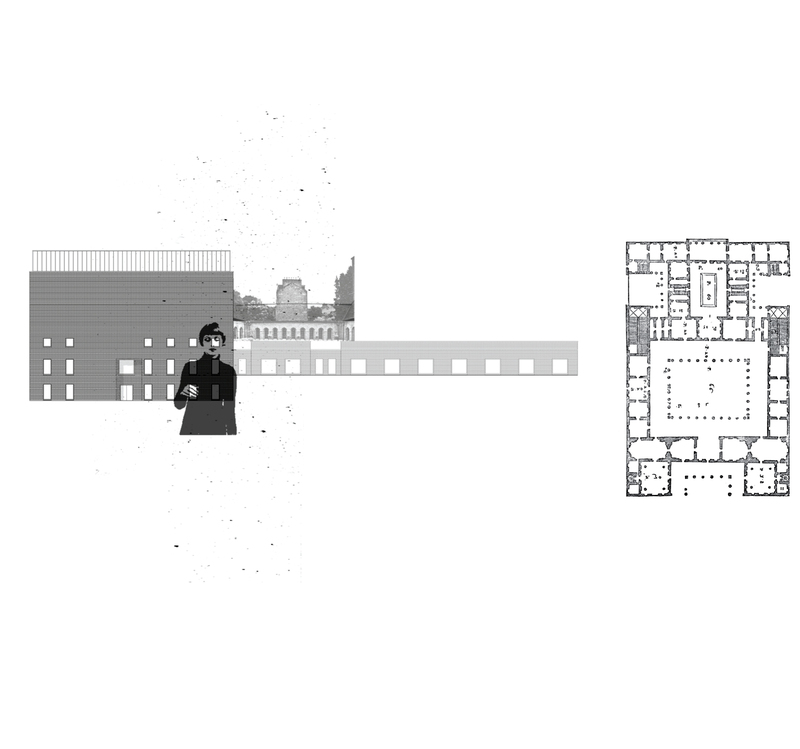 Each plan, in different ways, analyses the city and sees something in it – features, qualities, forms, objects, events, geometries – that was not seen by others. Once seen, the particularities become the basis for project thinking and design. Most of the city plans are theoretical projects by architects motivated by the possibility of influencing the urban condition through architecture’s formal potential by means of framing and representing the space of confrontation and coexistence, which is the city; and who take the view that architecture is a conceptual practice and intellectual pursuit. 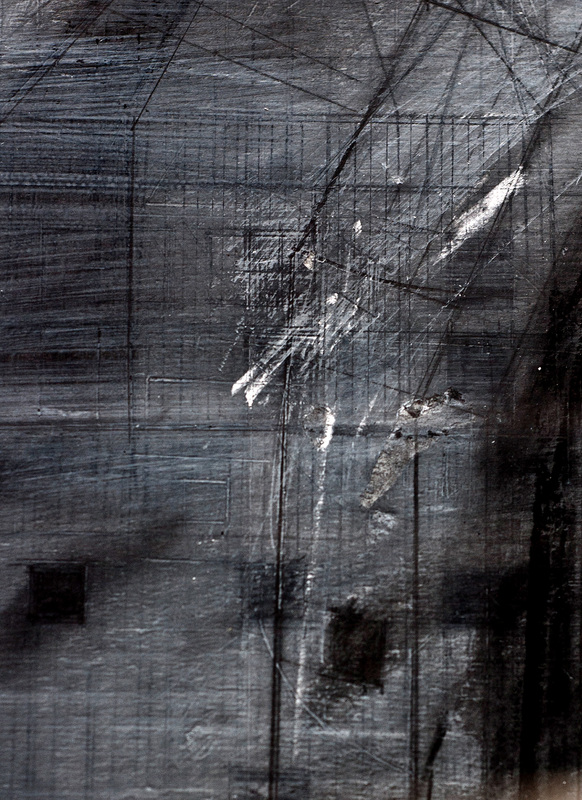 The emphasis on architecture as a conceptual practice – as a theoretical project – is important because it is by being presented as theory – a category autonomous yet in dialogue with design – that architecture goes beyond the art, craft or pragmatic construction of building to propose an intellectual contribution that addresses the potential for an alternative future urban life. 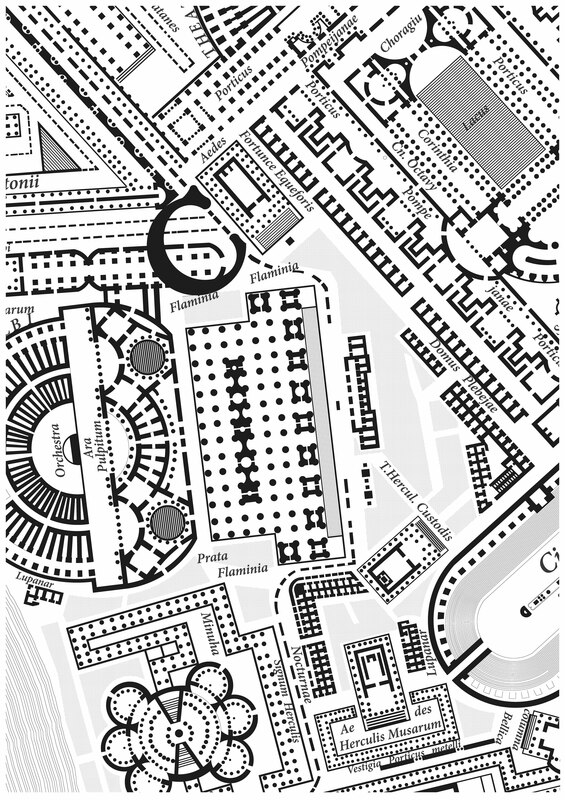 Image credit: A fragment of Piranesi’s Campo Marzio plan of Rome (1762), re-drawn by Jess Coxon (September 2014). 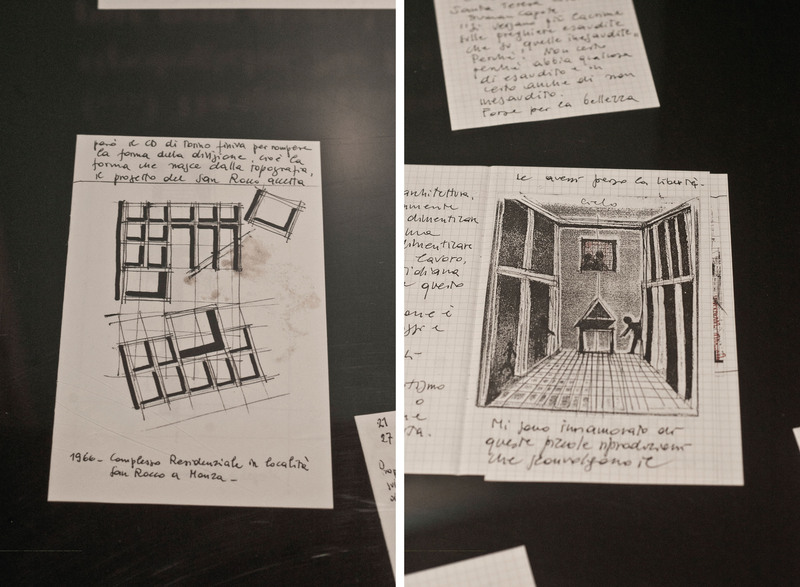 After being assigned a plan, each member of the Rooms + Cities Unit was required to produce a series of diagrams that describe the formal, conceptual and organisational principles of their plan, and to delineate a room within their city plan. Then a representative area of 500 metres square was redrawn at the scale of 1:500. 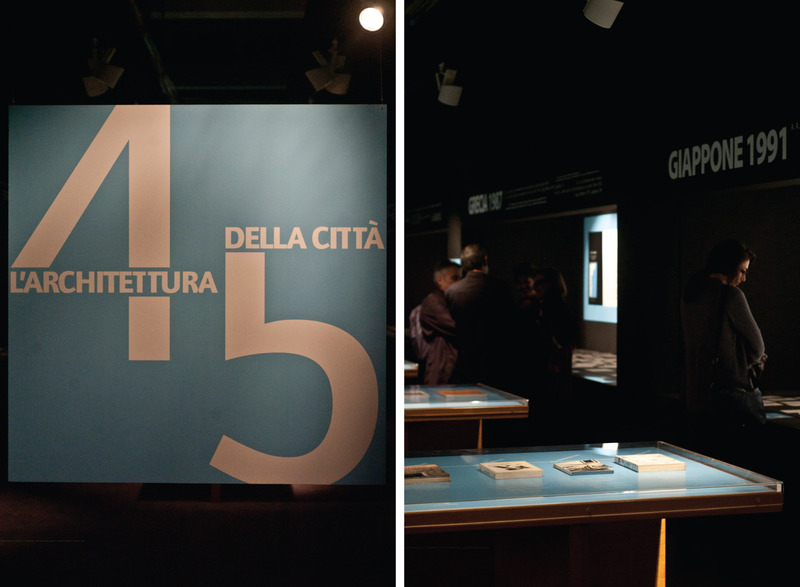 Accompanying these drawings was a short explanatory text to historically situate the city plan. The purpose of this project can be summarised in the following three ways. First, the act of redrawing the city plan is itself a form of architectural inquiry by means of architecture’s quintessential critical tool: the drawing. For this reason the drawings produced should not be viewed as illustrations of a canonical plan (although they are that as well), but as critical examinations into the ideas that underline each city plan and therefore produce knowledge about the particular plan. Third, the city plans act as critical reference points to be manipulated and transformed, and which can be used to generate ideas and city forms for the studio projects that follow. This project is developed with Lorens Holm in the Masters Unit entitled Rooms + Cities at the school of architecture in Dundee. Montage of Rossi (1976) La città analoga; and Serlio (1545) Scena Tragica. On the left, Rossi places a standing figure into the city making clear that the city is the result of human labour, both manual and mental. 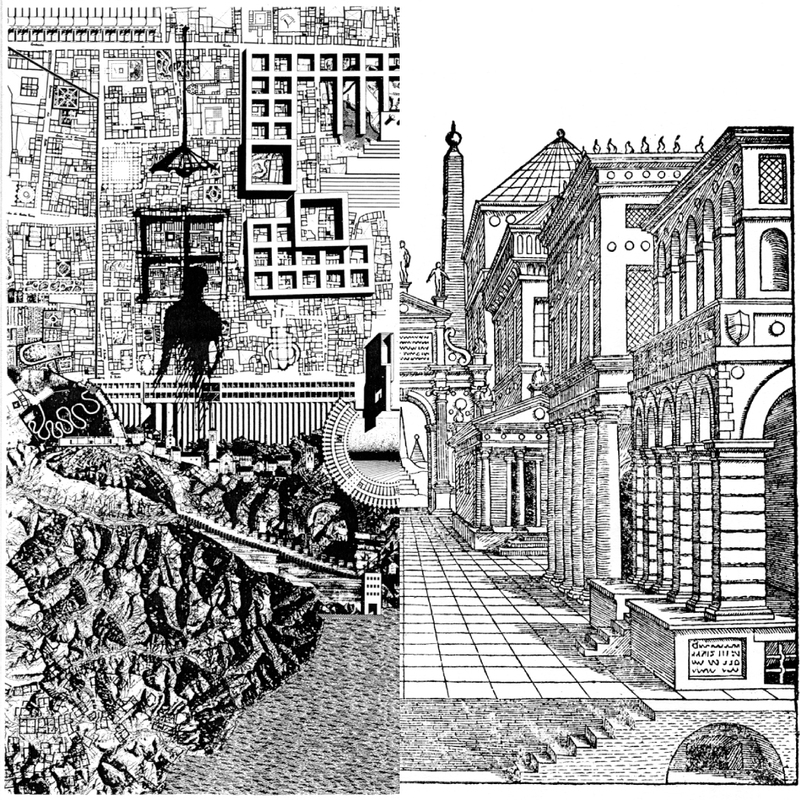 On the right, Serlio emphasises the street as a public space defined by a wall of buildings. While it is clear that architecture is not autonomous from culture, it is possible to understand architecture as autonomous in relation to culture because architecture is a discipline with its own rules, values, formal and conceptual principles which are put forward in theories, drawings, built and unbuilt examples. Yet architecture gives concrete form to culture and came into being with the first traces of the city. Architecture is rooted in the formation of culture and civilisation so that the history of architecture, which is the city, is also the history of culture. Architecture, culture and the city are therefore relational and co-determinate. The purpose of the following notes will be to briefly reflect on these points. “Mind takes form in the city;” said Lewis Mumford in The Culture of Cities “and in turn, urban forms condition mind.” Mumford’s words remind us of architecture’s formal condition and that the city embodies the sensibility, attitude, and dominant worldview of any given culture. Then, urban forms – architecture as such – condition the sensibility of any given culture because the architecture of the city is both a human creation of manual as well as mental labour and the willed expression of power, whether in the name of the state, religion, corporate patronage or some other authority such as a single figure. The city thus embodies private passions and desires, shared beliefs and needs, as well as the conflicts of a people, which always results in both the construction and destruction of the city. Think of the construction of great arches during the Roman Empire to celebrate war victories; or infrastructural projects like Haussmann’s Paris boulevards that destroyed vast areas of the city to represent an affluent Paris as a crucial centre of Europe; or the production of “iconic” buildings in the 1990s and 2000s that attempted to turn relatively unimpressive cities into global tourist attractions. By understanding architecture and the city as the embodiment of culture – of shared beliefs and needs as well as common sensibilities and attitudes – we can ask what is the culture of our current condition and how is this formalised in architecture? Let us recall another example. In Factories of Knowledge, Industries of Creativity Gerald Raunig says the following: “Knowledge economy, knowledge age, knowledge-based economy, knowledge management, cognitive capitalism – these terms for the current social situation speak volumes. Knowledge becomes commodity, which is manufactured, fabricated and traded like material commodities.” Here, contradictory keywords are conjoined: knowledge and economy, knowledge and management, cognition and capitalism. Knowledge is understood as collectively produced shared thinking and is founded on human cognition which is immeasurable and cannot be controlled nor quantified. By contrast economy, management, and capitalism represent mass-individualisation, extreme competition, and hierarchical control. In Raunig’s reflections, we can read the struggle between the human value of knowledge versus its gradual commodification by dominant power. The points made by Virilio and Raunig on the quantification of life and knowledge help frame the following architectural examples which can be read as symptomatic of a deeper cultural pathology that increasingly rejects the human sensibility for critical and creative imagination. Koolhaas’ (et al) Mutations, although now a dated text, is worthwhile recalling because it is the model of numerous recent texts. It surveys contemporary global urbanisation from cities and city-regions in Europe, America, and Asia. The text measures cities through statistics and indexes, and is illustrated by countless charts. Significantly, Mutations opens with a series of page spreads that comment on global population trends. The first reads: “At the outset of the twentieth century, 10% of the population lived in cities. In 2000, around 50% of the world population lives in cities.” This is a tiring statistic which is constantly repeated. Another text, Content, is a history of OMA/AMO since S,M,L,XL of 1995 and situates Koolhaas’ practice within the scope of global culture. In the chapter entitled “An Autopsy” global culture between 1989 to 2003 is charted in relation to the production of “iconic” buildings and the Dow Jones Financial index. It makes clear the link between architecture and its commodification within the framework of economic markets. 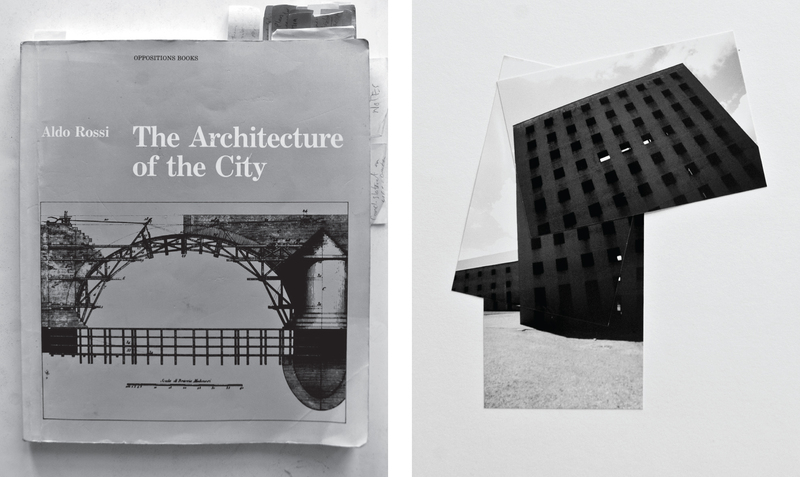 In the photomontage that illustrates the chapter, we see buildings by Zumthor, Gehry, Foster, and SOM amongst many others. We also see photographs of Kofi Annan, Princess Diana, Bill Clinton, and images of nuclear tests by India and Pakistan, as well as art exhibitions such as Damien Hirst’s in MOMA, New York. Comment should also be made on the objecthood of the book: a small, thick, glossy paperback magazine, saturated with images, photomontages, ideograms, advertisements, essays, interviews and statistics about global culture. It is an analogical reflection of the loud consumerist ethos of our age. Yet, to qualify this, Content still asserts the role of culture and understanding the city as a prerequisite for the production of architecture. While these are only two examples, we can cite many others to indicate the recent emphasis on quantifying the city, architecture and culture via technological-scientific language. For brevity, a few book titles should suffice: Weak and Diffuse Modernity, Recombinant Urbanism, The Endless City, A New Urban Metabolism. The preceding examples – from the critical reflections by Virilio and Raunig on the implications of “mathematicisation of reality” and social imagination, to the quantitative analyses of Koolhaas and others – serve as illustrations of our current cultural condition and its interplay with architecture in general. To end, here is the crucial point: instead of constructing complex mathematical models to “measure” architecture or endlessly analysing the city through “data,” we should remember that architecture is a form of cultural production and based on human sensibility, which is of immeasurable importance. Let us remember that architecture is an intellectual inquiry that questions urban life as such by putting forward alternative ways of living and critical interpretations of existing conditions. See for example the following: Franco Berardi, The Uprising: On Poetry and Finance (Los Angeles: Semiotext(e), 2012); David Harvey, Seventeen Contradictions and the End of Capitalism (London: Profile Books, 2014); Eric Hobsbawm, Fractured Times: Culture and Society in the Twentieth Century (London: Abacus, 2014); Antonio Negri, Art and Multitude: Nine letters on art, followed by Metamorphoses: Art and immaterial labour, trans. by Ed Emery (Cambridge; Malden, MA: Polity, 2011); Paul Virilio and Bertrand Richard, The Administration of Fear (Los Angeles, CA: Semiotext(e), 2012). 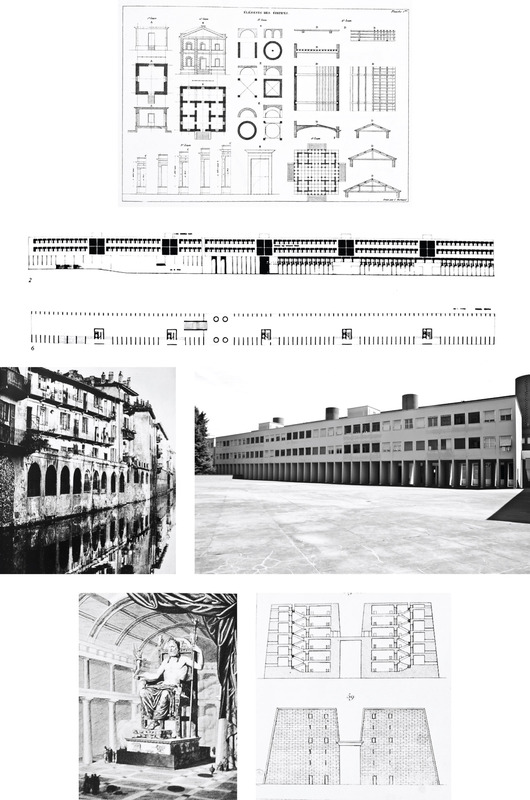 Typology in architecture gives us an apparatus to study the history of architecture, which can also be understood as a way to examine the collective memory of the city. As can be seen in canonical texts since Vitruvius, such as those by Alberti, Serlio, Palladio, during the Renaissance, to Durand during Enlightenment, Hilberseimer in the early twentieth-century, Rossi in the 1960s and others, we can view the process of architectural history unfolding, treatise to treatise, manual to manual, and manifesto to manifesto. Although not all of these works use the word typology, or type, the concept is implied because each use classification, description, and historical precedent to formulate a position. For example, in De re aedificatoria Alberti distinguished between public and private buildings in the city, assigning the Orders to certain classes of building. Serlio’s books on architecture catalogued buildings from Ancient Rome in plans, elevations and perspectives, before describing the typological-form of temples: circular, square, six-sided, eight-sided, oval and cruciform. Palladio’s Four Books organised the Orders, private buildings in rural and urban settings, then public buildings and, buildings of historical significance. In Durand’s books, the Recueil et Paralléle, and the Précis des leçons d’architecture, the former catalogued existing works of architecture from different cultures and historic periods at the same scale. While the latter was divided into three: on architectural elements, on composition, and on analysis of building types. Hilberseimer’s Groszstadt Architektur was organised into ten chapters with the first two and final describing the urban condition and proposing a response. Those inbetween address in succession the building programmes of the city from residential, commercial, high-rises, halls and theatres, transport, industrial, trade construction. 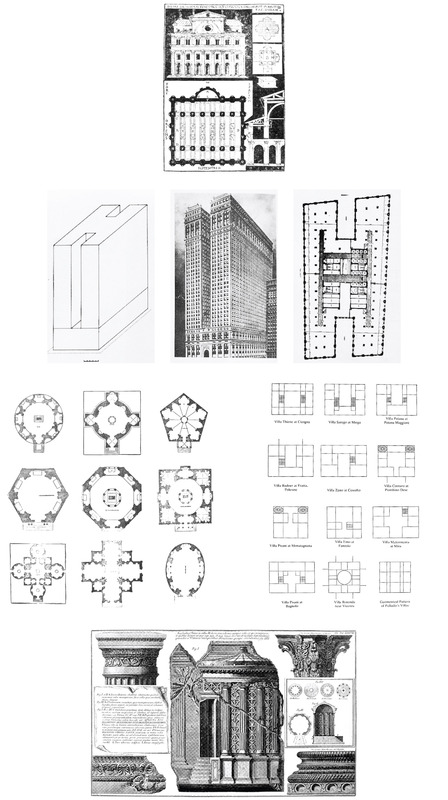 I have noted these texts because as Rossi wrote in The Architecture of the City, the concept of type became, “the very idea of architecture,” a fact attested to by both practice, he says, and by the treatise. Although in this sketch of a few texts that deal with theories about type, an emphasis is seemingly placed on type as it relates to classification. It should be made clear, however, that the idea of type is a dialectical principle, because it always reacts with, say: form, construction technique, site irregularities, means of production, cultural particularities, history, and also, the autobiography of the architect. Later in The Architecture of the City Rossi discusses the concept of collective memory, via the sociologist Maurice Halbwachs, who wrote that historical memory reaches us through written and visual records. The concept of collective memory and of type are closely interrelated, because collective memory relies on material reality. A material reality which is manifest both in built form and as images in treatise. Built form because buildings witness the evolution of the city. Images because they embody values, experience, ideas. What is important is that type constructs a link with history, and produces transmittable knowledge. Accordingly, architecture communicates its own history through typological ideas. 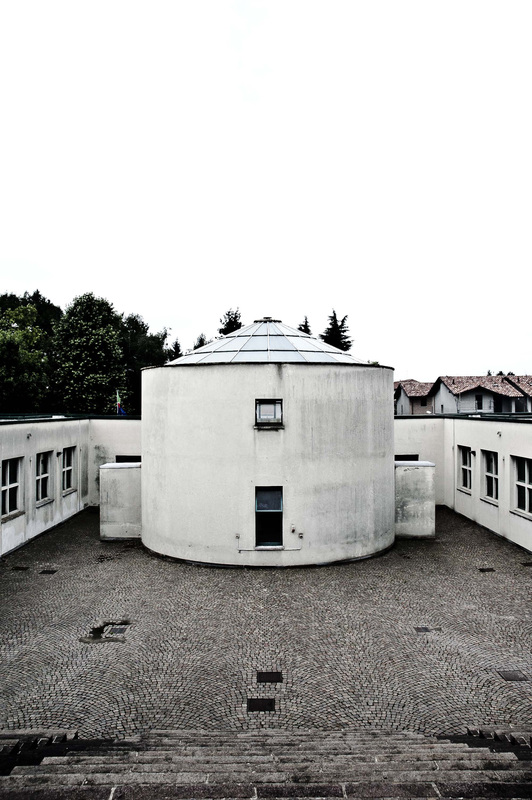 One of the premises of the AE Foundation is to understand the history of architecture as central to the education and practice of the architect. Undertaken within the framework of the AE Foundation Graduate Programme, the project opposite is for a school in the Lochee part of Dundee. 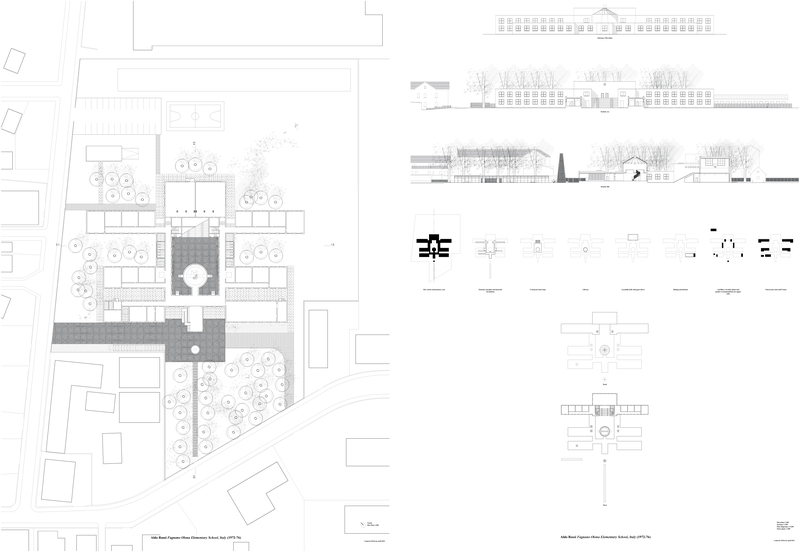 The typological approach has been to distinguish three volumes that articulate three conditions of the site. The tower fronts the street edge and contains the entrance, administration, dining, gym hall, and a nursery. Classrooms are arranged around a courtyard which opens into the school grounds. Between the courtyard and tower is a rectangular volume which holds a library and an art studio. In order to leave and to arrive at the classrooms, children (and teachers) must always pass through the art and library spaces. The spaces of creativity and of knowledge. 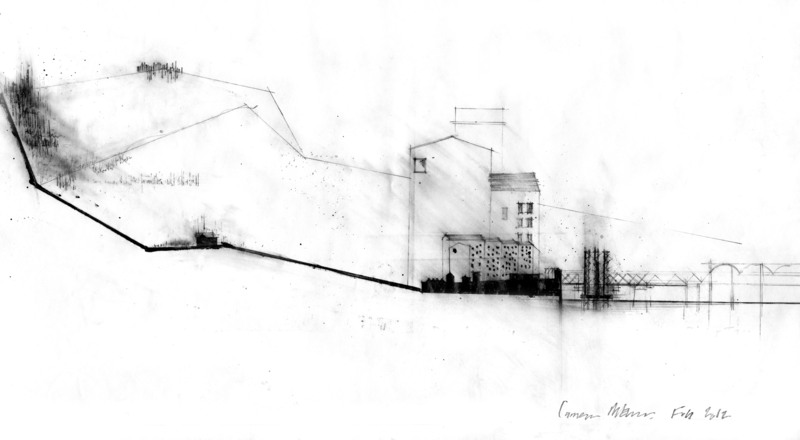 A transect drawing made for the Geddes Institute for Urban Research at Architecture, Dundee. It represents Dundee and its environs from the agrarian north toward the Cairngorms, through to the post-industrial city, and water edge of the Tay. The rail bridge and oil rigs are ghosted in.